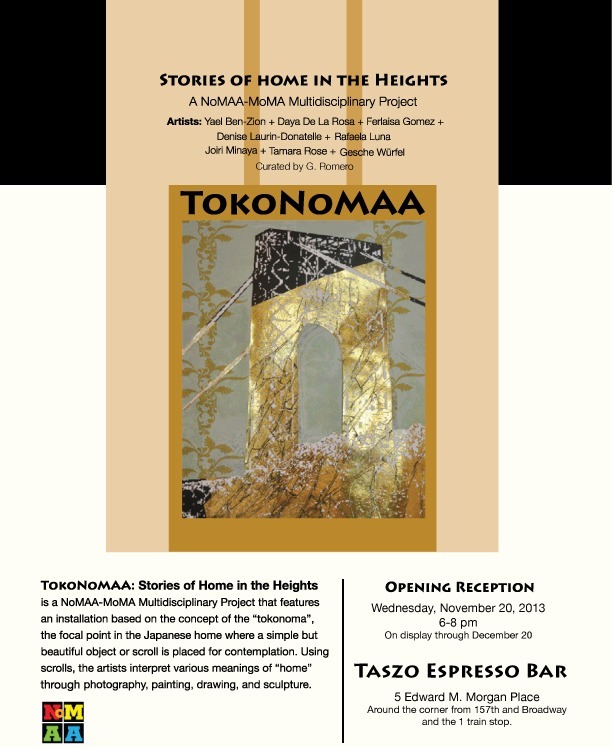 TokoNoMAA: Stories of Home in the Heights is a NoMAA–MoMA multidisciplinary project that features an installation based on the concept of the “tokonoma,” the focal point of the Japanese home, in which a simple but beautiful object is being placed for contemplation. 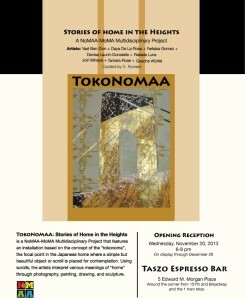 Using scrolls, the artists interpret various meanings of “home” through photography, painting, drawing, sculpture. Opening reception: Wednesday 20 November 2013, 6–8 p.m. Participating artists: Yael Ben-Zion, Daya De La Rosa, Ferlaisa Gomez, Denise laurin-donatelle, Joiri Minaya, Tamara Rose and Gesche Würfel. For more information, contact Denise Laurin-Donatelle, [reveal e-mail].